Editor's note: We’re currently hosting a multi-city Chrome roadshow in locations near you to explain how Chrome benefits your business and to show the latest Chrome for Work devices. Businesses of every size around the world are taking a lesson from the education market and adopting Chromebooks thanks to the speed, simplicity, shareability and security the platform offers. A March 2015 ESG-Group survey also indicates that 70 percent of IT professionals expect Chromebooks to supplement or replace their existing device footprint in order to cut costs and safely improve employee productivity. We’ve listened to business customers who have had a need for lightweight devices that don’t compromise on battery life, performance or build quality, and that provide the enhanced security businesses demand. And today with HP, we’re happy to introduce the HP Chromebook 13, the latest professional laptop that’s ultraportable — one of the thinnest and lightest in its class — and offers a new Chromebook docking station to boost productivity and help Chrome work for you. At just 0.5 inches thin and starting at 2.86 pounds, the anodized brushed aluminum HP Chromebook 13 is a capable travel partner to and from meetings. It’s also ideal for online meetings, thanks to Audio by B&O Play and a 720p webcam for clear sound and video. Both meetings and work will look great on the 13.3-inch display, available with either full HD or a pixel-packed 3200 x 1800 (QHD+) resolution. Inside is plenty of power for business grade multi-tasking, with configuration options ranging up to an Intel 6th generation Core m7 processor and 16GB of internal memory. Working through the day won’t be an issue either thanks to a battery that lasts for up to 11.5 hours* between charges. The optional HP Elite USB-C Docking station and port replicator accessories turn the HP Chromebook 13 into a full desktop solution with additional USB 3.0 ports and dual display support. 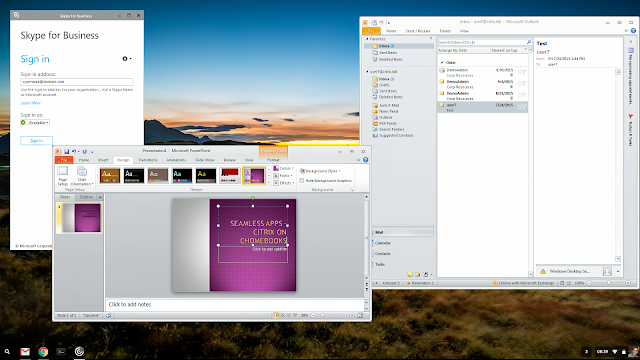 For our customers who are using a Microsoft infrastructure, we’re excited to announce the improved Citrix Receiver 2.0 for Chrome, a virtualization solution that lets you remotely use apps from other platforms in their own window, even from the Chrome OS launcher. You simply use legacy and Chrome apps the same way, whether they’re local or remote, in browser tabs or individual windows. We also now offer direct integration with the Microsoft PKI based off of Active Directory Certificate Services (ADCS). You can get more done at your desk with a Chromebook too: support for 3+ monitor and UDL 3.0 DisplayLink support is baked into Chrome 51, currently in the Beta channel. For organizations using smartcards for authentication, such as banks and government institutions, we’ve launched a Certificate Provider API that technology partners are integrating with. And we added the ability to centrally restrict network access for organizations operating in sensitive environments. 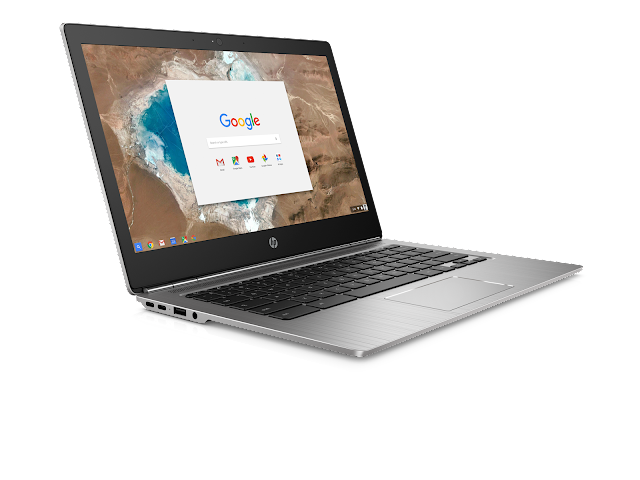 HP Chromebook 13 starts at $499 in the US, with pre-orders starting today at our reseller partners, and availability from HP and directly through the Chrome for Work site starting in May. *Battery life may vary depending on specification, usage and other conditions. To get the best repair service for your broken gadget then reach to Best Buy Geek Squad. The experts here would never disappoint you & would give you the best of services in respect to your broken device. Call the Best Buy Geek Squad experts anytime you need their assistance. Geek Squad Online Support group provides you the best advise for tech products. This service could be availed while connecting with them via chat or mail services. Irritated customers can ask for help anytime between 24/7. Our experts are available 24/7 and give Webroot Customer Service . For more information visit our website and avail Webroot Customer Service. and get best assistance from our experts. We are active 24/7. Webroot Install Help the customers to easily download and install Webroot Antivirus Software at any device. Our experts are available 24/7 to provide Webroot Install Help. If you want protection with your PC, download install Webroot Geek Squad . We provide 24/7 support, call and install Webroot Geek Squad. Very interesting to read. I really love to read such a nice article. Thank you for sharing such an information related to HP Printer problem, HP Printer Support Number +1 877 301 0214.
technical support and provides Aol technical support phone number +1800-684-5649 27X7. Mailcom email customer support offers comprehensive services for email networks. The support team are highly qualified and experienced and assist you in rectifying all your queries, issues, and other email related problems. The technicians provide services round the clock, just to deliver efficient and effective solutions. Get assistance from the experts by dialing the toll-free number of Mailcom customer support number and diagnosis all email related glitches. Nevertheless, the executives are extremely skilled, and after understanding the whole concern, the team will make their best efforts and get an effective solution for troubleshooting issues. Mail com support is a web-based email service provider company which provides free webmail application with infinite storage for emails. Mail.com is choosing by almost 200 domains users for their personal, professions, beliefs and many other users. Get assistance from the team of Mail com customer service team by dialing the toll-free number. Epson printer support team gives better services to the users for guaranteed satisfaction. If you meet any error regarding printing, then contact the trusted Epson technical support center. Dial the Epson printer support number for best results as you will get proper aid from it. All of your issues will get resolved instantly as the professionals are there for 24 hours t help you. HP Printer Support number for instant support round the clock. The deft and experienced connoisseurs are available to tackle your difficulties. They have ability to provide you top-class solution in a minute. you need to buy, download, install and then activate it. To perform these processes, there is a series of steps that needs to be followed. Thanks Chrome works for new HP Chromebook 13 in best and affordable price. It's a knowledgeable and featured post for everyone which need latest technology. Visit our Digital Marketing Agency in USA for increase your website traffic and rank on Google's first page by using update Google algorithm. Canon Printer Support. The customer service team is made up of expert technicians who can troubleshoot all technical issues concerning printers. Super website with a great sharing and amazing stories is ur web.. The Brother Printer Customer Support has made a significant name in the domain of printers. It’s vital to install and arrange the printer in an exact manner to make the printer offer the best performance to the clients. Dial the Brother printer support phone number to get assistance when you encounter problems such as print spoolers, paper jams, bad print quality, error codes, empty ink warnings, connectivity issues, etc. The technological superiority of Dell is unmatchable with any other brand. In fact, not only its product quality is great but Dell Printer Support Number is amazing and one contact the tech support very easily and conveniently. The tech support is called as the technical expertise. The advanced tools and techniques enable these technical experts to handle all sorts of technical issues associated with the Dell devices.In addition, Dell Printer customer support is ready to provide the remote help and the immediate solutions will be in front of your eyes for all sorts of complications of your printer. Brother printer is the leading brand name for manufacturing printers, multifunction printers, large machine tools, label printers, typewriters, fax machines, and many other computer related products.At Brother printer customer support you can get the best technical support for all your Brother printer related glitches. You just need to dial the toll-free number of Brother printer customer support. The services available 24/7. great presence of mind u had ...every time I amazed with ur article. we provide ALO support phone number which opens 24*7*365 and we charged a very minimal amount of money for this. u can contact us any time anywhere. Tata Motors is coming with couple of exciting cars scheduled for launch in next few months. These include the Altroz, Buzzard and Hornbill. Clearly, with these Upcoming Tata Cars the homegrown brand is aiming significant growth in coming days.